What did you like best about The Swarm? What did you like least? Liked best: the parts of the story were those that actually dealt with the Formics strategy and actions, also the politics of the I.F. were interesting. Liked least: Without giving away too much, there is a character in this book that magically discerns far too much about things that previously only were discovered in the far future according to other Ender/Shadow books. SPOILER ALERT: Specifically, the philotic connections between things; they were just figuring that out hundreds of years in the future according to the Ender/Shadow books, but somehow a person on Earth before the second war theorizes it? Not likely. Get rid of the above mentioned character that knows way too much about the Formic's capabilities. 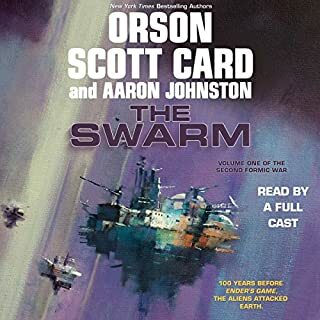 Was The Swarm worth the listening time? I've listened to and/or read all of the books so I'm sure I'll get the next ones but I sure wish they would finish a story instead of adding filler to sell 2 or 3 books.